Railay, or Rai Leh, is a popular beach in the Krabi province of Thailand. Located at the Andaman Sea coast, the beach features picture-perfect views of white sand and emerald-colored waters. This although is not how most Railay tourists remember their visit. The feature that makes the place more magical than other beaches is the limestone cliffs. These towering geological formations are known for the climbing opportunities they offer. Railay Beach is a perfect destination for all those who wish to sunbathe, swim, and enjoy beach life. In addition to this, there are a few other activities that you can indulge in. Rock climbing – The limestone cliffs that separate Railay from the mainland are considered to be some of the best places for rock climbing. There are more than 700 routes with varying difficulty levels. A number of training schools and climbing gear shops offer opportunities to scale the craggy heights. 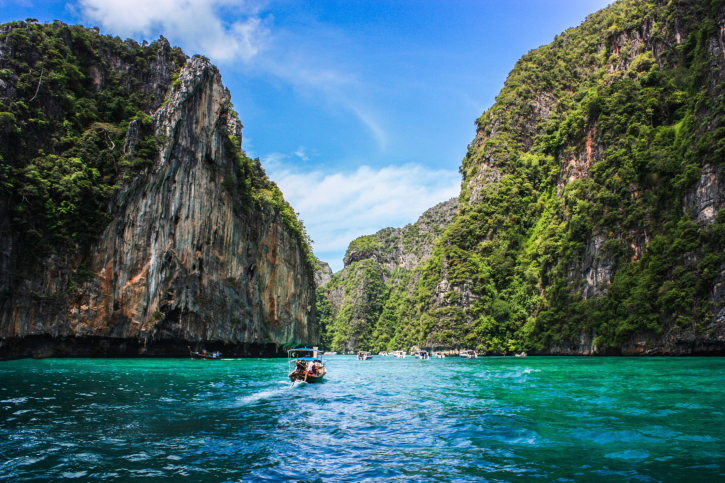 Kayaking – The Andaman Sea surrounding the beach has numerous small islands, coves, and caves that have fascinating sights and associated legends. Hiring a boat and paddling through the mysterious tunnels, caverns, and ‘hongs’ can be a worthwhile experience. Cruises are also available for exploring popular places near Railay Beach. Snorkeling – Offshore snorkeling is another favored activity in Railay. 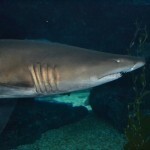 Operators offer island exploring and snorkeling combinations to maximize the fun in the sea. Trekking – The tropical forests in Railay are home to several beautiful floral species, birds, and animals. Along with these, the swampy trails lead to some wondrous locations like those leading to Diamond Cave, Lagoon View Point, and Phra Nang Bay. Railay Beach has two major parts – Railay East and Railay West. Railay East, also known as the Sunrise Beach, is not really a beach but a wetland. It has visually stunning mangroves and is the dropping point for most tourists. Railay West, or the Sunset Beach, is a stark contrast from the eastern side. It has white sand, swim worthy waters, and palm trees lining the beach, thus completing the postcard view. In addition to these, here are other attractions worth visiting in and around Railay. Phra Nang Beach – Located at the southern tip of the Railay peninsula, the beach gets its name from a princess who is believed to have drowned here. Local legends say that she still lives at the beach as a spirit and blesses those who worship her and offer her phalluses. A shrine dedicated to her is situated toward the north of the beach. 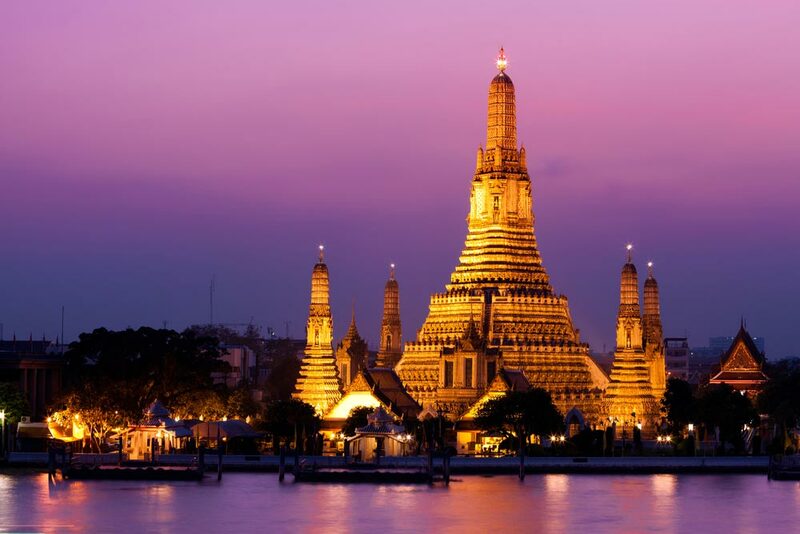 Phra Nang, on the other hand, features white sands, massive cliffs, and green waters. During the peak season, it gets pretty crowded. Tham Phra Nang Nai – Famous for limestone caverns, Tham Phra Nang Nai is located near East Railay. A journey through the hike across the cave, which is also known by the English name ‘Diamond Cave’, takes between 10 and 15 minutes. The limestone formations are worth checking out, including the quartz waterfall that glitters like gold. There is an entrance fee for seeing the cave. Sa Phra Nang – It is a lagoon hidden in the rainforest in Railay East. It can be reached after a rather difficult hike through swampy and hilly terrains. The fact that makes it even more interesting is that the nearby clifftop offers some of the best views of the land. Ton Sai – A short walk away from Railay West is Ton Sai, which has a beautiful shallow beach and magnificent limestone cliffs worth climbing. It is renowned for having cheap hotels and several climbing schools. The site is in fact much popular among backpackers and budget travelers. Shell Cemetery – This cemetery in Ao Nam Mao is famous for its 75-million-year-old fossil shells of gastropods or Su-San Hoi. Visiting hours are between 8:30 a.m. and 4:30 p.m. and there is an entrance fee. Khao Khanap Nam – A boat ride away are two 328-foot tall mountains with stunning caves. It has not only interesting stalactite and stalagmite formations but also skeletons of men who are believed to have perished trying to settle down here. The cave is open for viewing between 8:30 a.m. and 4:30 p.m. and there is no entrance charge. Wat Tham Seua – Tiger Cave Temple (in English) is a Thai Theravada Buddhist pilgrimage site renowned for its location in a forest valley, ornate shrine, and gilded statues of Lord Buddha. Tourists will need to climb 1,237 steps to reach the temple. It is about 5 miles away from Krabi Town. Accommodation in Railay costs more as compared to other Thai beaches, owing to its popularity and the fact that everything reaches by boat, from food to supplies to people. 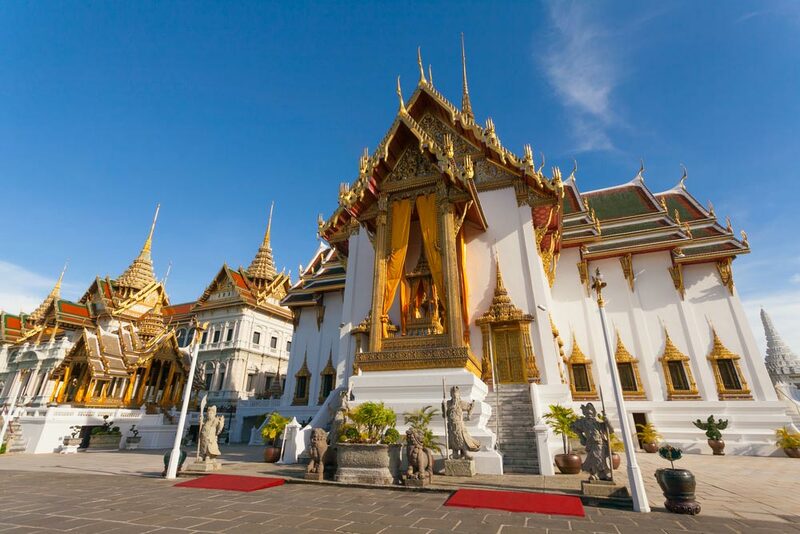 Luxurious properties may cost above 10,000 Baht in peak season, whereas budget accommodations are priced anywhere between 500 Baht and 4000 Baht. Mid-range hotels are not that well-furnished. Budget travelers can find varied options from bungalows amidst greenery to pool-side and sea-side resorts in Railay East. Rapala Rockwood Resort, Sunrise Tropical Resort, Princess Resort and Spa, and Phutawan Resort are highly rated budget accommodations. Most well-known luxury resorts and bungalows are situated in Railay West, including Rayavadee Resort in Phra Nang Beach, Railay Village, and Railay Beach Club. Railay Beach is one of those beaches where reaching the destination in itself is an adventure. Located on the Railay peninsula, the beach is cut-off from the mainland owing to the mountains. It, therefore, has no direct road, rail, or plane connections. In order to reach Railay Beach, traveling through the waterways will be required. 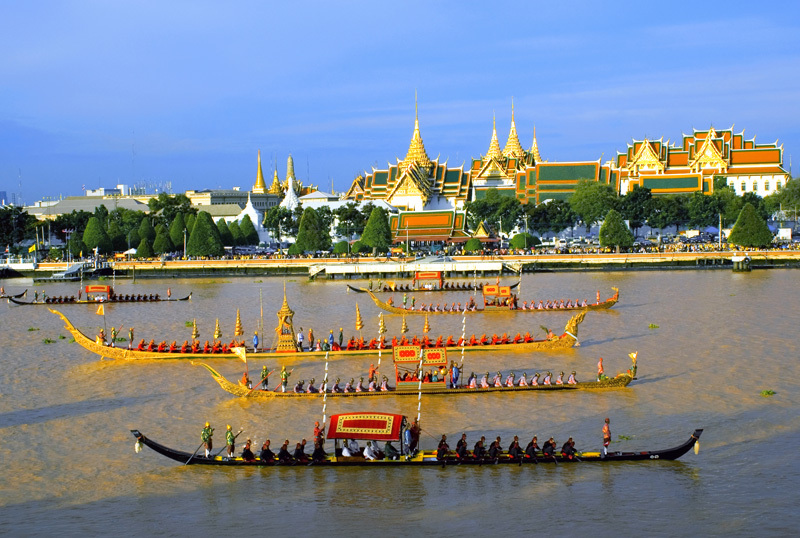 By Airways: The nearest international airport to Railay is in Bangkok, which is connected with the whole world. 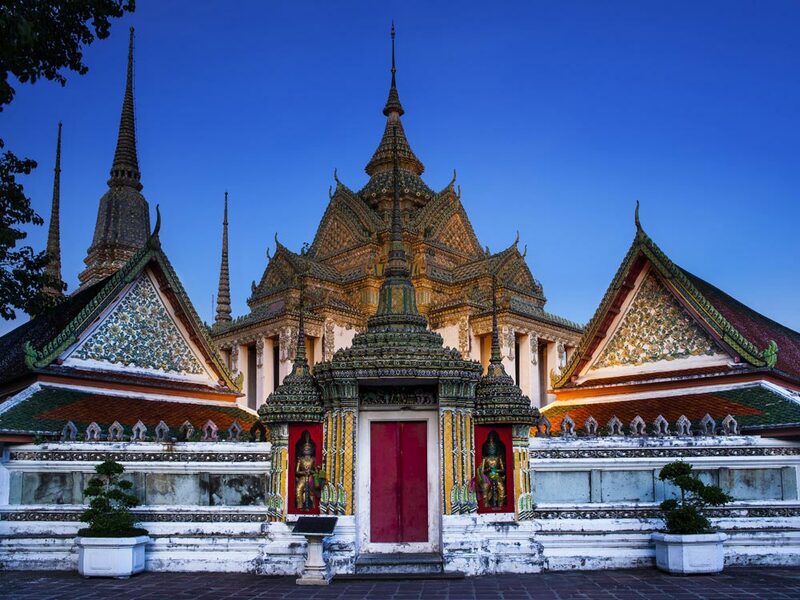 From Bangkok, you can take a flight to Krabi. Foreign tourists can look for direct or indirect flights to Krabi from their country. Thai Airways, Asia Air and Tiger Airways are some of the airline companies offering flights to Krabi Airport. Bus and taxis are easily available near Krabi Airport to reach Krabi Town (6.2 miles) or Ao Nang (24.85 miles). Both these towns have long-tail boat operators plying boats all day to Railay Beach. By Waterways: You can reach Railay Beach from Ao Nang, which is just 1.6 miles away. A long-tail boat takes about 15 minutes to reach Hat Railay West. An alternative way of reaching Railay is from the Khong Kha pier in Krabi Town. The Journey from the pier to Hat Railay East is of about 45 minutes. When weather is unfavorable, boats ply only from Ao Na Mao, which is 15 minutes away. 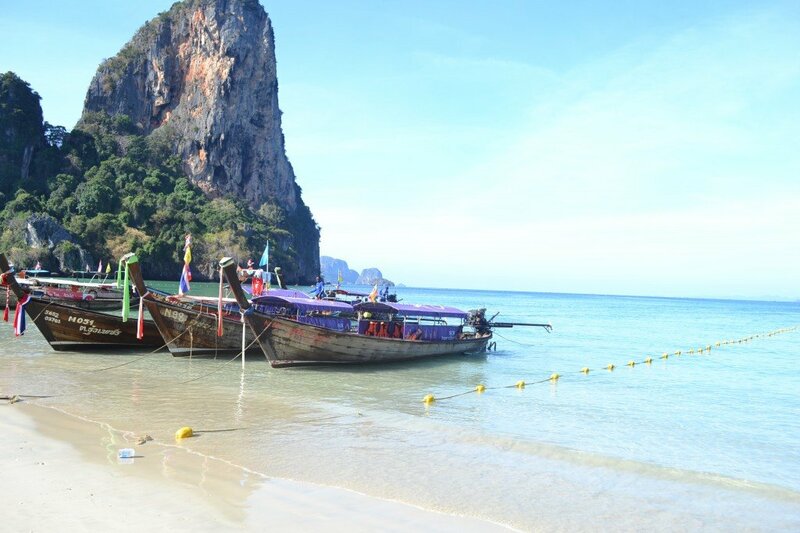 Tourists can also take ferries to Railay Beach from Phuket, Lanta, and Phi Phi. Railay Beach is usually hot throughout the year due to its location near the equator. The heat although is not unbearable owing to the cool winds from the Andaman Sea. Temperature hence averages between 82.4 °F and 89.6 °F. March and April are hotter than other months with temperature reaching to a maximum of 98.6 °F. Rains bring the temperature down a few degrees, the minimum being 75.2 °F, usually in January. The weather between November and April is pleasant and dry as compared to the months from May to October, when rain occurs more frequently and humidity levels are much higher. The high season, from November to April, is also known for large tourist crowds and high costs. Budget travelers can visit during the low season, from May to October, and enjoy other activities in Railay instead of beach lounging. Can Railay Beach be a day trip? It is possible to visit Railay Beach as a day trip. Tourists usually make Ao Nang or Krabi Town their base and take a long-tail boat to Railay in the morning. Boats start from 7:30 a.m. onwards. 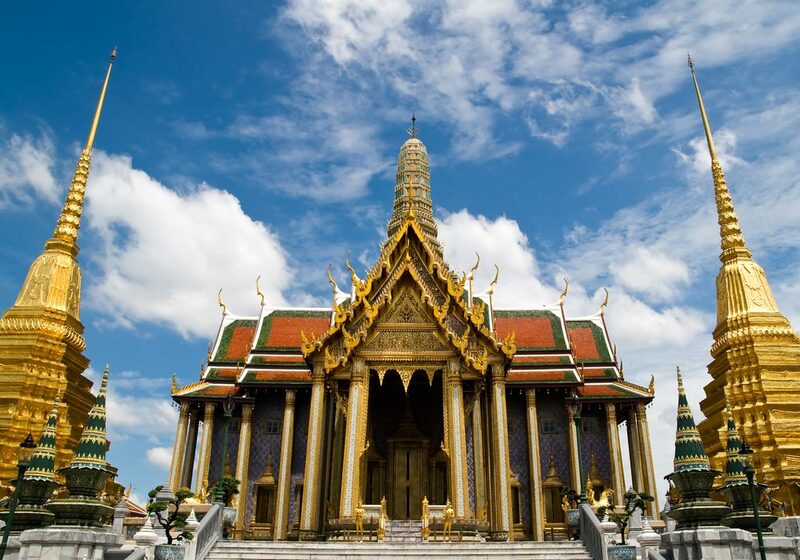 Popular places to visit include Phra Nang Beach, Phra Nang Shrine, Diamond Cave, and Railay West. There are a number of restaurants and bars nearby. Return time can be as per convenience. Till 6 p.m., boat operations are regular. After 6 p.m., they will charge extra. Can rock climbing be done alone in Railay? The cliffs in Railay are not the same everywhere. Some of the routes are extremely strenuous and dangerous. It is best to find enough information from the locals in order to climb alone. What are the things that should be kept in mind when visiting Railay? Railay is expensive. So, carry enough money or have supplies with you to avoid paying more than the price of the item. Most restaurants serve basic Thai food. 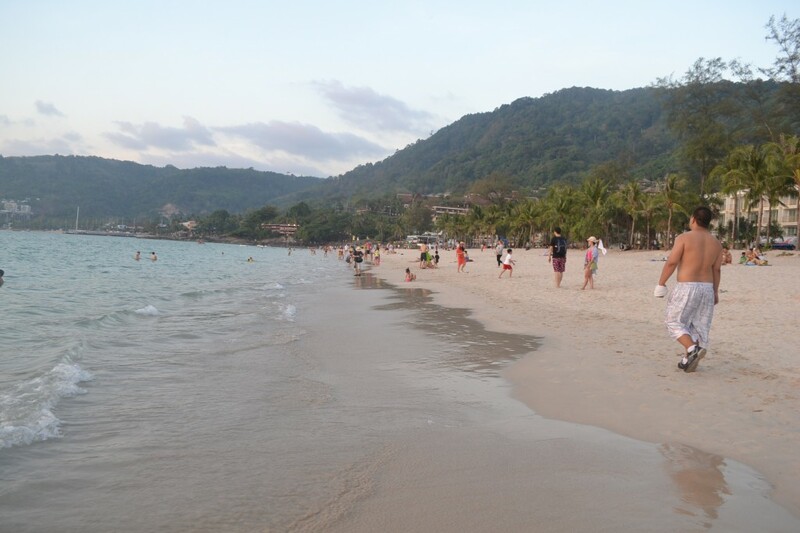 Gourmands and foodies should visit another beach in Thailand rather than this. Expect to feel hot outdoors. Carry water and wear comfortable shoes, hats and sunglasses for sun protection. While rock climbing, make sure your gear is secure and safe. Accidents do not inform before happening. Touts and souvenir sellers are everywhere on the beach. 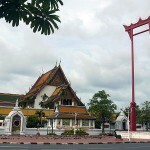 Budget travelers can wait till they reach Krabi Town or Ao Nang to do their shopping. Even though Railay is a part of the mainland, it gives an island feel, due to the fact that it can only be reached by boat. Railay Beach is most renowned for rock climbing. The limestone cliffs are well eroded by the sea to provide good holding spots while climbing. During low tide, Railay peninsula can be scaled on foot. It is possible to reach Ton Sai, a beach adjacent to Railay.